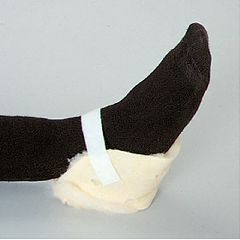 SkiL-Care Triple-Ply Heel Protector is a uniquely designed heel pad that places three layers of high-pile synthetic sheepskin under the critical pressure point of the individual’s heels. Maintains resiliency for constant pressure relief. Washable. Sold in pairs. These are so much better than the pair I purchased at our local DME provider. They are sewn much better, provide more protection and comfort, and were even slightly less expensive than what I bought locally. I am using them on a family member who has a pressure sore on her heel. She likes them so I ordered a second pair.